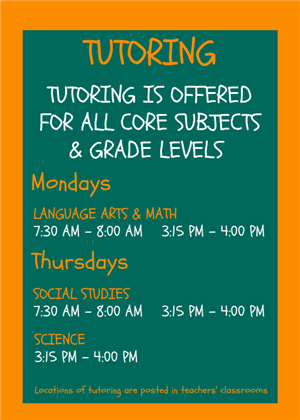 TUTORING - Tutoring for all core subjects is offered before and/or after school. 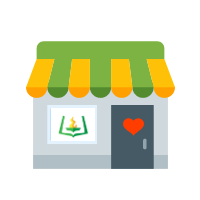 For locations, click here. It is indeed an honor to serve at principal of Kennedy Middle School. I am truly blessed to be have been the instructional leader of such a great school community for the past 5 years. 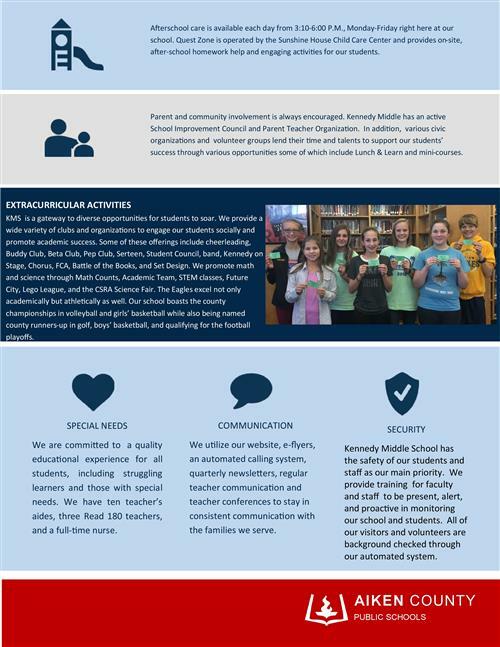 Here at Kennedy Middle School, we are excited about the new changes that the 2018-2019 school brings. This year is going to be “Great” as we continue to provide academic experiences that are rigorous, relevant, and allow our teachers and students to build relationships with one another. 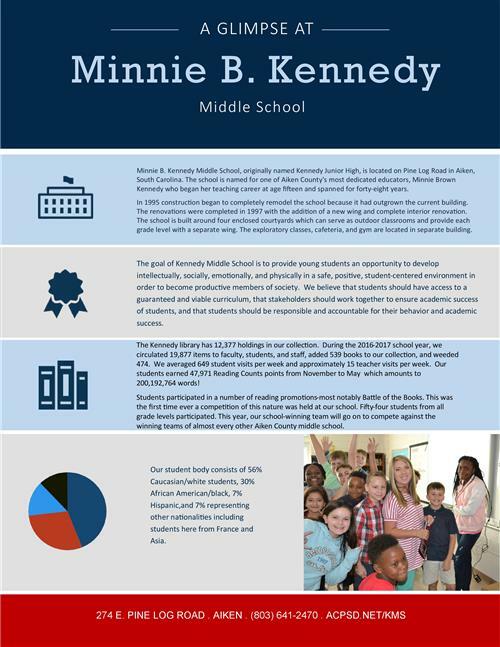 As the principal of Kennedy Middle School, it is important that everyone feels welcomed when they walk through our doors and are excited to be a part of the Kennedy Middle School community. This welcoming environment helps us to meet the daily challenges of academic excellence in a positive, fun, and nurturing environment. Our theme for the 2018-2019 school year is “Every Eagle Counts.” We are committed to providing challenging, educational experiences. At Kennedy, we recognize that we cannot do our jobs without the support of our community. It is important that our community embrace the idea that doing whatever it takes to help all students achieve academic success. With this being said, we need your support in our school. You are an integral part to the learning community. Collaboration and open communication is vital to ensure that we have a successful school year and a successful home-to-school partnership. Parent and community involvement is paramount to our school’s success. There are many ways in which you can participate at Kennedy Middle School. You may volunteer to help make copies in the front office, chaperone field trips, become an active member of PTO and/or School Improvement Council, mentor students, and assist with many activities are just a few things that you can do to help us our school. As the instructional leader of Kennedy Middle, my goal is to increase student achievement, provide a safe and conducive learning environment, increase parental/community involvement and make decisions that are in the best interest of all students. There is no I in Team – Together Everyone Achieves More. If I can ever be of assistance, please don’t hesitate to call or email me. 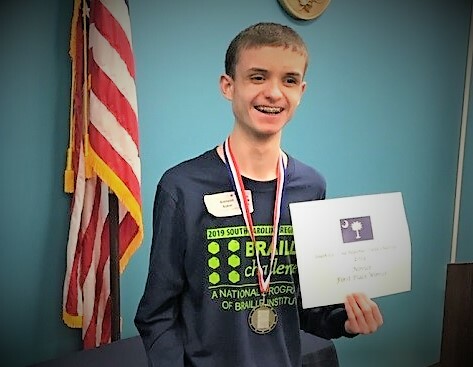 For a closer look at the Attributes of Premier students in Aiken County Public Schools, click on the words "Attributes of Premier Students," or simply look around your school as we're sharing these attributes in a big way and posters and banners are everywhere!